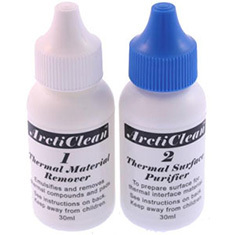 ArctiClean 1 uses a proprietary combination of non-toxic biodegradable solvents to emulsify thermal greases or thermal pads. The citrus and soy based solvents in ArctiClean 1 match or exceed many hazardous and volatile solvents such as fluorinated and chlorinated organic solvents, acetone, MEK (methyl ethyl ketone), mineral spirits, isopropyl alcohol, and toluene. Most solvents and cleaning products leave residue on the CPU and heatsink that negatively affects the performance of any subsequently applied thermal interface material. ArctiClean 1 Thermal Surface Purifier removes the residue of citrus or petroleum based cleaners and inhibits flash corrosion on a copper or aluminum heatsink.